This Texas mom has taken multi-tasking to a whole new level, putting us non-breastfeeding folk to shame in the process. 29-year-old mom Carlee Benear’s Instagram has gone viral after she started posting photos of herself doing yoga poses while breastfeeding her child. Benear now has over 8,000 Instagram followers and counting. Other yoga-practicing moms have also started following her example, posting their own yoga brelfies. 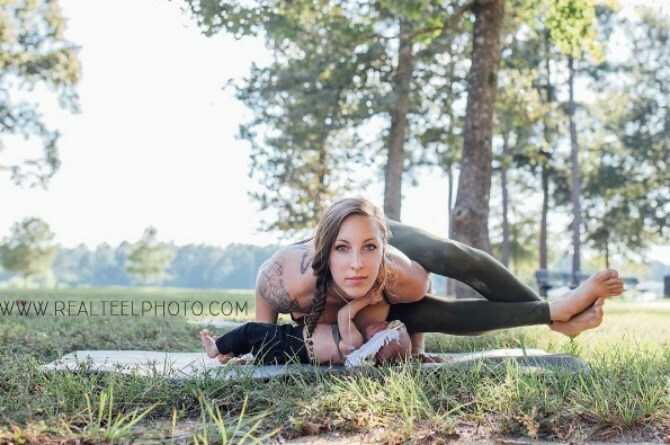 On the next page: find out how Benear started her yoga practice and how it's changed the way she parents. Benear has two older children: 5-year-old Milam and 2-year-old Cale. The poses that Benear holds while breastfeeding her daughter are very advanced, but it wasn’t until after the birth of her second child Cale that she started practicing yoga. She went on to say that her two sons also enjoy practicing yoga. It’s safe to say that it won’t be long before little Maramaylee follows in her footsteps as well.